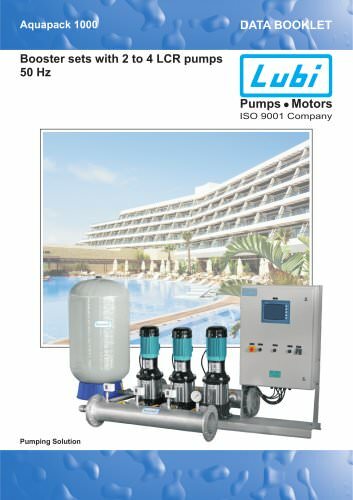 Catalogs > LUBI INDUSTRIES LLP > Booster sets with 2 to 4 LCR pumps. Dimensions & weights Aquapack 1000 Booster sets with 2 to 4 LCR pumps 2 pumps Booster set with 2 pump Design A: Aquapack 1000 booster set with a control cabinet mounted on the same base plate as the pumps. Design B: Aquapack 1000 booster set with a control cabinet centred on the base plate. Design C: Aquapack 1000 booster set with a floor-mounted control cabinet. Design D: Aquapack 1000 booster set with a control cabinet mounted on a separate base plate. Dimensions & weights Aquapack 1000 Booster sets with 2 to 4 LCR pumps 3 pumps Booster set with 3 pump Design A: Aquapack 1000 booster set with a control cabinet mounted on the same base plate as the pumps. Design B: Aquapack 1000 booster set with a control cabinet centred on the base plate. Design C: Aquapack 1000 booster set with a floor-mounted control cabinet. Design D: Aquapack 1000 booster set with a control cabinet mounted on a separate base plate. Dimensions & weights Aquapack 1000 Booster sets with 2 to 4 LCR pumps 4 pumps Booster set with 4 pump Design A: Aquapack 1000 booster set with a control cabinet mounted on the same base plate as the pumps. Design B: Aquapack 1000 booster set with a control cabinet centred on the base plate. Design C: Aquapack 1000 booster set with a floor-mounted control cabinet. Design D: Aquapack 1000 booster set with a control cabinet mounted on a separate base plate.